After witnessing the Russian Victor Oganov’s (26-1, 26 KOs) 9th round KO loss at the hands of Colombian punching machine Fulgencio Zuniga (20-2-1, 17 KOs), I must admit that I wasn’t the overly surprised by the ease of the 9th round stoppage victory for Zuniga. I’d only seen a couple of Oganov’s fights – against Sam Reese and Richard Grant – but that was all I needed to see to know that Oganov was overrated and wasn’t in the same class as Zuniga. As it turns out, I was correct. In this regard, Oganov represents the class of that is built up over time by throwing him in with overly soft opposition, in other words, fighters that he can easily beat to help build an impressive knockout record. All those KO victories for Oganov looked impressive on paper, but when you dug deeper and saw who they were against, you quickly discovered that only two of the names were recognizable, and neither of them were ranked in the top 10. Honestly, Oganov shouldn’t have been in the same ring with Zuniga, because he wasn’t ready for such a big step up in competition, even though he’s 31 and in his prime. Given his the class of his inept competition, Oganov should have fought a fighter several steps lower in class than Zuniga. 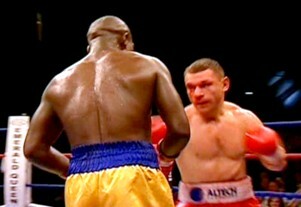 From the looks of it, however, it appeared that his people gambled by selecting Zuniga as a opponent, knowing that they were taking a big chance by matching Oganov so tough, but likely thinking about the reward involved – a potential championship matchup – should he have come out the winner against Zuniga. Obviously, they should have taken their time and increased his competition in slow incremental steps rather than a huge leap up like they did, going from Richard “The Alien” Grant to Zuniga all at once. As it is, there’s nothing that can be done about it now, but hopefully for Oganov’s sake, he has some say in future matchups.